The murals in the Roman churches were educational aids in the learning of the Christian faith. They are richly represented in the Scanian and Zealand churches. The murals, which were done on the walls of the churches, was part of the Roman style. These were often done on the wall, which is called the triumphal wall, which separated the choir from the aisle. The triumphal wall had a big vault (the triumphal arch), in which a triumph crucifix hung. The motif on this wall was taken from the bible and was often a series of pictures. It was a simple and effective way of spreading the message of the gospel. Sometimes there were pictures of the founders of the church and benefactors. Fjenneslev Church ornamented by the Finja-workshop from Scania, while the Jørlunde-workshop mainly worked in North Zealand and is presumed to have been connected to the Hvide-family, perhaps as artisans in their service. While the lengthy Byzantine-influenced reproductions are characteristic of the Finja-workshop, one of the marks of the Jørlunde-workshop is the use of stucco in connection with the paintings. Ordinarily the Roman mural is considered somewhat rigid and immovable, but in the works of the Jørlunde-workshop, figures with movement and plasticity are common. The Madonna-motif, which is known in innumerable variations from books and icons, is also present in the murals. As in this example from a niche altar in Måløv Church, which is Byzantine influenced and perhaps with a script as the source. 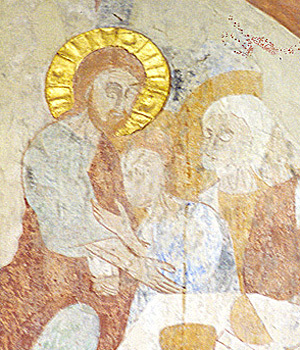 In Tveje Merløse Church there is a Madonna picture close to the women´s entrance, towards the west wall with the magnate gallery, which also features the only known painting on a west wall. In many apses ”Majestas Domini" (The power of the Lord) were painted, which was a common motif in the Roman style. In this motif Jesus sits with an almond-shaped halo on a rainbow throne. The four symbols of the evangelists often surround the whole picture. This composition has its model in Byzantine emperor pictures. A fine example of this motif is in Vä Church outside Kristianstad. The Majestas Domini motif is very common in Scania and in Zealand. Jesus as the mighty ruler could easily be connected to the power ambitions of the church and the royal power.